Images of hundreds of people stuck in snow in their cars overnight on snowy roads have filled the news headlines over the last few days in the UK, yet there is one easy way to avoid all this chaos. How long will it take for this solution to be implemented? 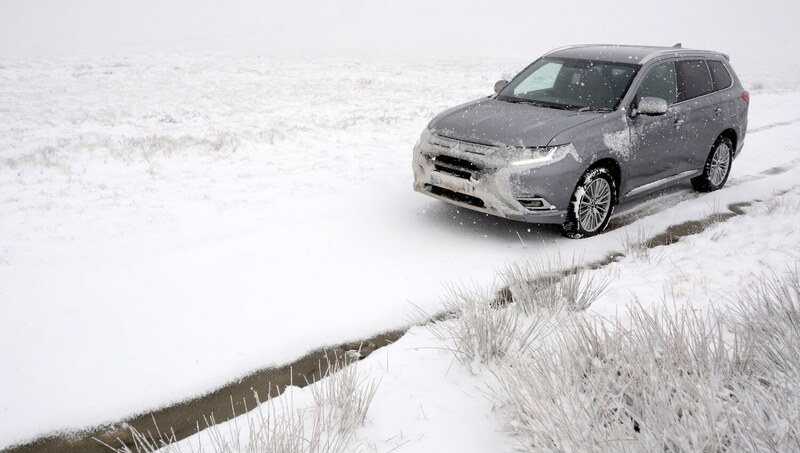 For many years it’s been accepted that the UK grinds to a halt with just a few centimetres of snow. This results in people being stuck in snow in their cars overnight, there are more accidents, and schools are closed – with the resultant economic impact of parents being unable to work. 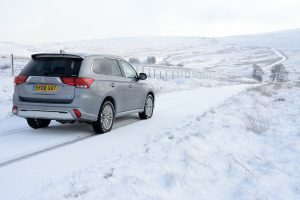 One solution is winter tyres, which are highly effective in snow, however people are reluctant to spend money on an extra set of tyres, and then have them swapped twice per year, for an average of one or two days of snow per year. 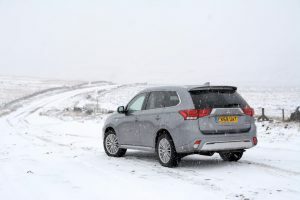 So what is the solution that the UK could adopt that would solve all the problems that we’ve seen on our TV screens of many hundreds of cars being stuck in the snow on major routes around the country? Imagine having your car fitted with tyres that are effective in summer, but also effective in snow and ice. 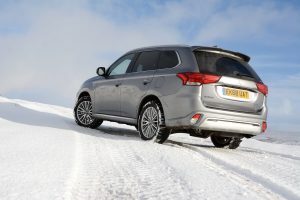 These tyres don’t have to have any detrimental impact on your car’s performance in summer (or winter), on fuel economy, on wear, on noise, on ride, and they’re not hugely expensive. Sounds too good to be true? Well, such tyres do exist, and they’re called All-Season tyres. 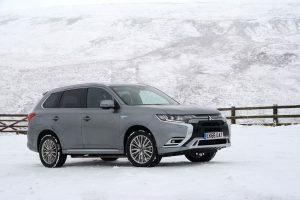 And Green Car Guide is testing them on a 2019 model year Mitsubishi Outlander PHEV, specifically Michelin CrossClimate all-season tyres, which have a unique tread pattern and a unique compound. 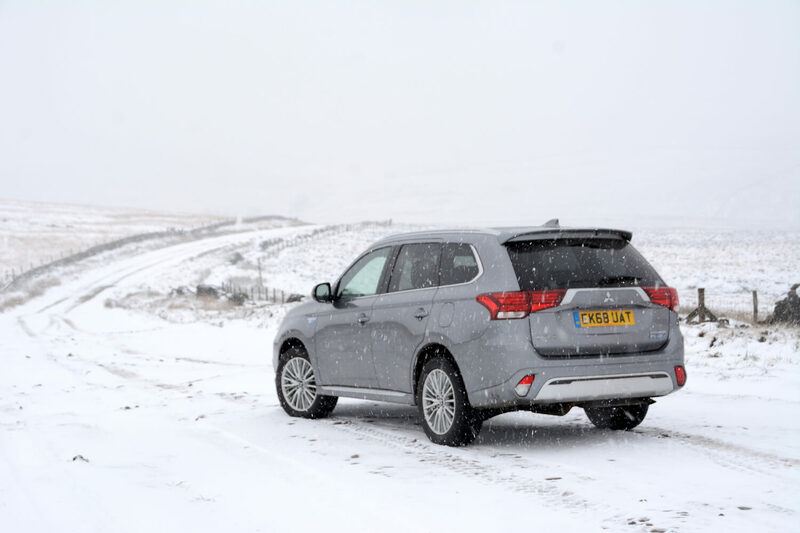 We’ve already reported on how the CrossClimate tyres perform on sheet ice, but over the last week we’ve had plenty of snow to test them in. 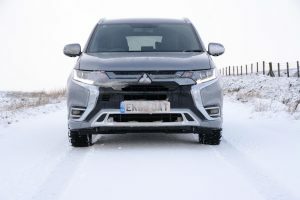 So are they as good in snow as they are on ice? 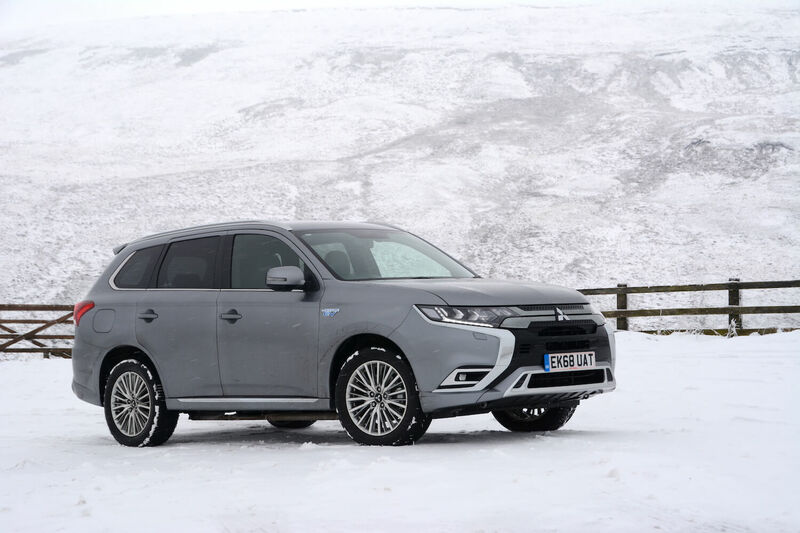 The answer is yes; despite all the snow and the hills that the Peak District could throw at us, nothing could stop the Outlander Plug-in Hybrid making progress. As well as the tyres providing the ability to drive on snow as though it’s just normal tarmac, the key thing is that the tyres give you the confidence to drive anywhere in any conditions. 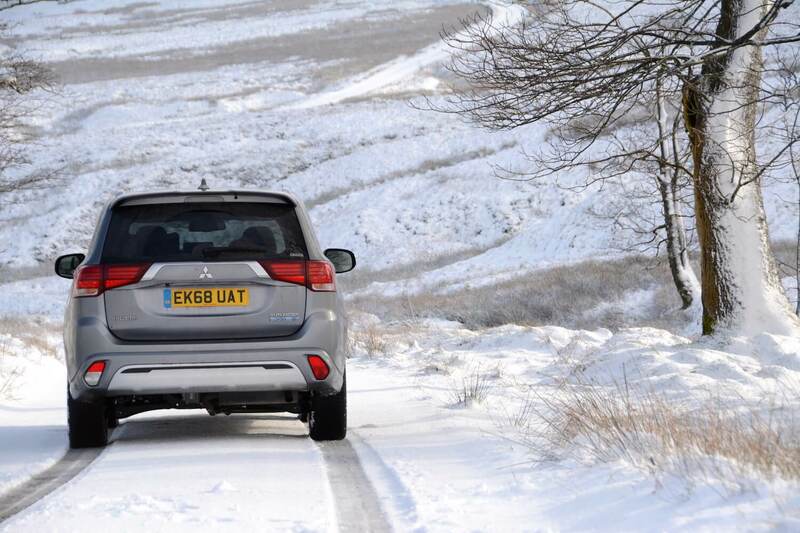 So if you want to drive the kids to the top of a snowy hill to go sledging, you can do that. 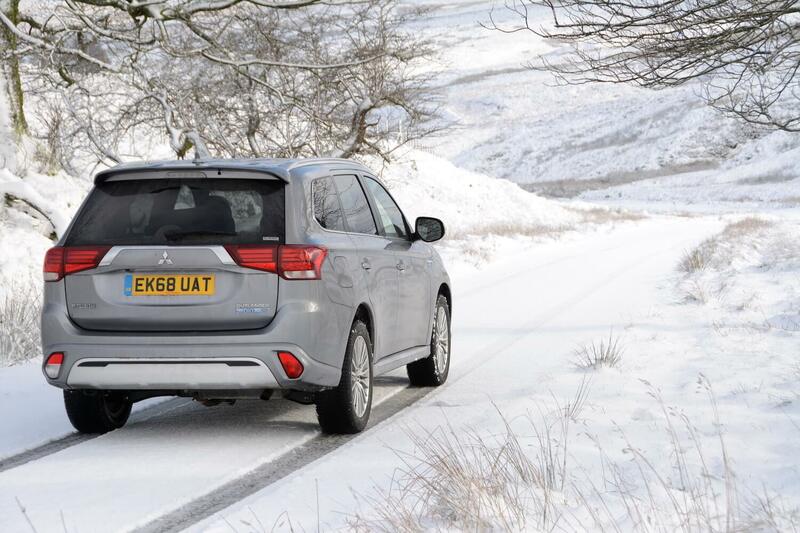 In fact we’ve not yet discovered any downsides to the tyres. Apart from one thing. Which is that most other cars on the roads don’t have winter tyres or all-season tyres. So even if you can drive anywhere in the snow and ice with no problems, if the road in front of you is blocked with hundreds of cars with normal tyres, you’re still stuck going nowhere. Not much has been happening recently with progressing bright ideas for the UK because Parliament has had no spare bandwidth due to all the focus being on trying to sort out Brexit. 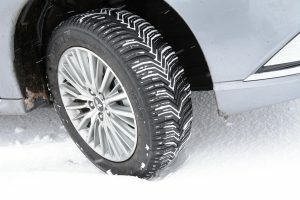 If the government ever stops having all its time taken up with Brexit, and has the ability to turn its attention to things that could improve the UK, then looking at legislation for all vehicles to eventually transition towards all-season tyres would be something that would prevent all the chaos of people being stuck in their cars overnight, and all the associated safety issues. 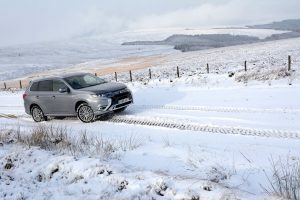 We’ve been reporting that the majority of SUVs and 4x4s that we’ve been sent to review for many years just have standard road tyres and therefore they are completely incapable of driving in mud or snow. 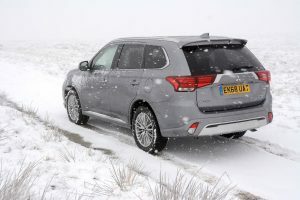 We just don’t see the point of buying a 4×4 SUV – with all the 4×4 technology, weight, cost and impact on efficiency – if the all-wheel drive technology can’t be transferred to the road – or the mud or the snow. 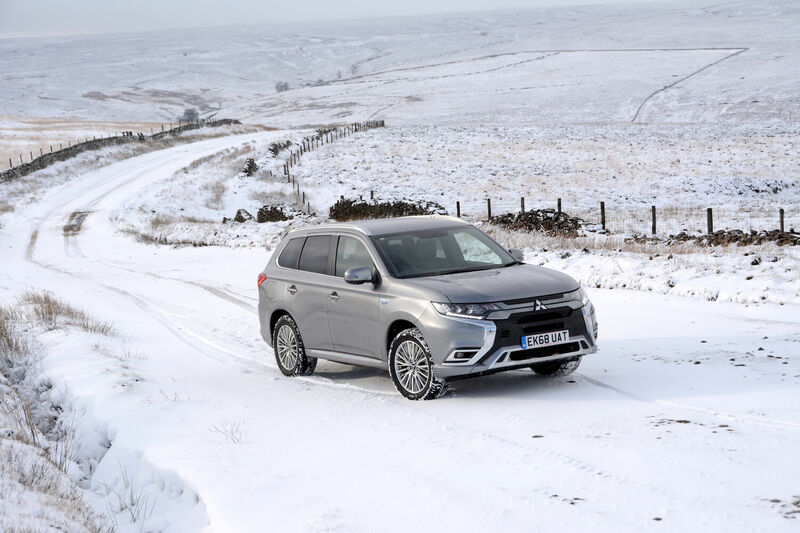 It’s worth noting that the Michelin CrossClimate tyres carry a mud and snow symbol, as well as the ‘mountain’ symbol allowing you to drive in parts of Europe where winter tyres are mandatory for insurance purposes. 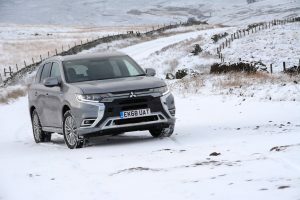 Trialling the Michelin CrossClimate all-season tyres on the Mitsubishi Outlander PHEV also shows that electric cars can be extremely capable. The Outlander PHEV is averaging 103.5mpg, yet it can go pretty much anywhere – including when it snows or when there’s sheet ice. And driving up a snowy mountain in silent pure electric mode is an incredibly satisfying experience. So if you’ve been stuck in the snow, or if you’ve not had the confidence to venture out because of winter weather forecasts, then fit all-season tyres, and have no fear in going anywhere. Even if you have a two-wheel drive car, these tyres can prevent you being stuck in your car overnight, but if you fit them to an electric all-wheel drive SUV such as the Outlander, you can truly enjoy the fun of the snow rather than be fearful of it.